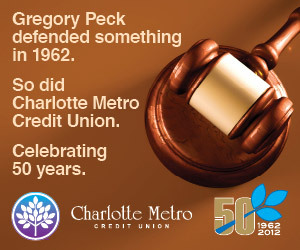 Charlotte Metro Credit Union is celebrating its 50th anniversary. Founded in 1962, it now has eight branches in the Charlotte area. It appears to me that business is good for CMCU, as it is likely experiencing some of the resurgence that many credit unions and small, local banks around the country have ever since the "big banks" helped cause the financial meltdown a few years ago, and as consumers have grown increasingly frustrated with the practices and fees by some of the large institutions. So as CMCU markets the benefits of its services and touts its 50 years of serving Charlotte, it has been doing so with a bit of an edge. A TV commercial CMCU first aired in the local market on NBC during the Super Bowl took shots at the big banks, which, as you know, have a major presence in Charlotte. "Apparently there's no limit to what big banks will do for profits," says the voiceover as the commercial shows, what is presumed to be, a banker going around sucking money out of people's pockets with a vacuum. In this, as in several of CMCU's advertisements, it ends with the slogan "like a bank...only better." A couple of days ago I came across the ad below on charlotteobserver.com, in which the square web ad reads: "Fidel Castro started something in 1962. 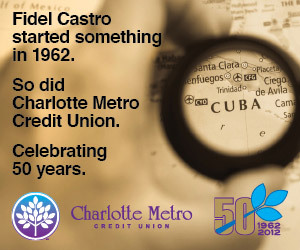 So did Charlotte Metro Credit Union. Celebrating 50 years." I was like, "What, Castro?" Because the first thing that came to mind was the controversy stirred up recently by Miami Marlins manager Ozzie Guillén after his comments about Castro, which made it clear how it can be risky to associate yourself in any way with the polarizing Cuban leader. I'm assuming the "Fidel Castro started something in 1962" line in the ad is referring to the Cuban Missile Crisis. Putting my Don Draper hat on for a minute (my new addiction to Mad Men manages to creep up often in my conversations), here's why the ad doesn't work. 1) Until I Googled, I didn't know what Castro did in 1962. Yes, I'm knowledgeable of the Cuban Missile Crisis, but the date it occurred isn't infamous like 9/11. 2) When you see the web ad as a solo piece of promotion for the bank, it makes you question the association with Castro. It wasn't until I did a little digging that I came across a second ad, that uses Gregory Peck, that I realized it's part of a series (see that ad below). "Gregory Peck defended something in 1962," it reads, referring to the late actor's portrayal of Atticus Finch in To Kill a Mockingbird. Again, it takes too much work for the consumer. I appreciate the cleverness of it, but the campaign falls short without a reveal--the ads should link to a promotion that gives more depth to the campaign--sort of like Google Doodles; instead, when I clicked on them they simply took me to the bank's homepage. So, in short, the Castro ad doesn't work. I am, however, more fond of this 30-second commercial about CMCU's 50th anniversary. It shows quick glimpses of several historical figures and important moments from the 1960s, including John F. Kennedy, Jackie Robinson, Marilyn Monroe, a space shuttle launching, as well as a shot of Castro, a news clip of "The Cuban Crisis," and a marquee of Gregory Peck and To Kill a Mockingbird. The TV spot works because you're given the full context right away.